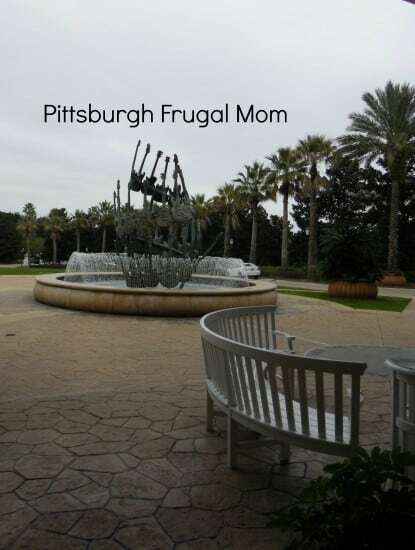 Traveling is always a fun adventure, but when you travel and stay in great places, it is always worth bragging about. 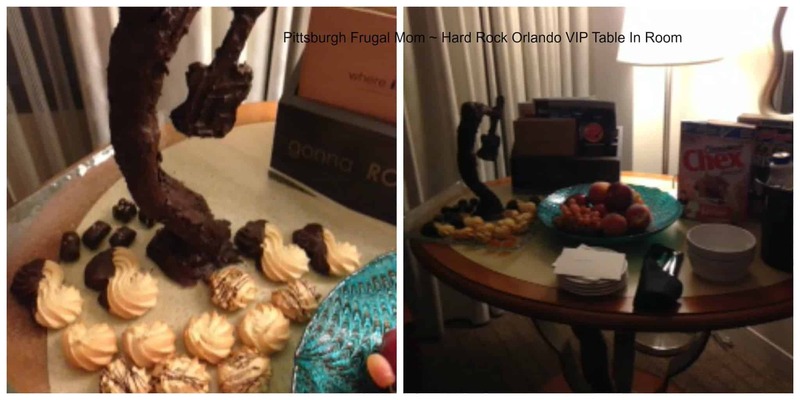 Have you been to a Hard Rock Hotel lately? 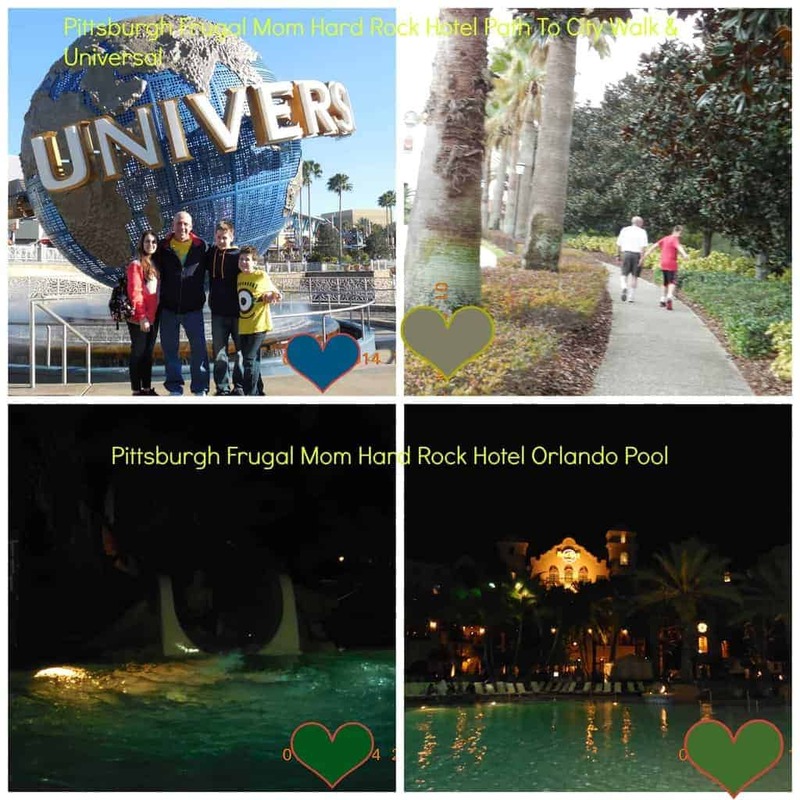 We stayed at the Hard Rock Hotel Orlando and rocked, grooved, swam, ate, drank and loved every minute of it as it is family perfect lodging and perfect as a home away from home when in the Orlando area or if you are visiting Universal Orlando. 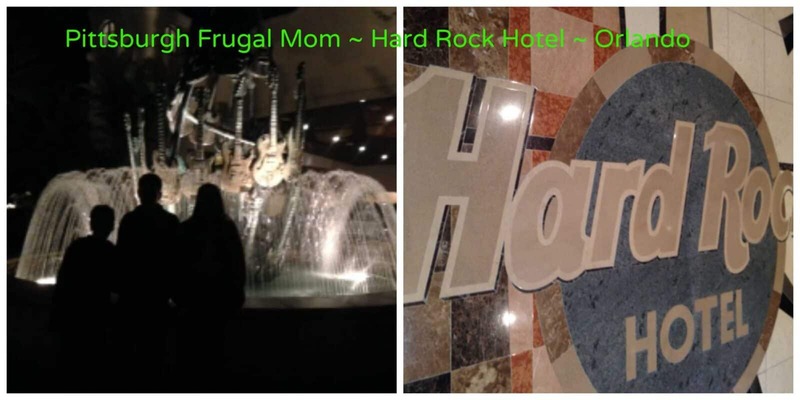 Here are a few things you might want to know, before you go, and some reasons why staying at the Hard Rock might just be the coolest thing you have done. Hard Rock Hotel understands the needs of those vacationing and when you leave you will leave relaxed as everything from your car to your room is taken care of every step of the way and all you have to do is enjoy. As we drove through the entrance, I was so taken by the beautiful driveway, I almost missed noticing the GUITAR Fountain, but have no fear, we took a walk out later that evening to see it lit and enjoy the water. As we arrived, we were welcomed by a huge U-Drive that offered a covered drop-off for a vehicle, as well as check-in parking and full Valet service. The hotel architecture offers a California mission style facade. I even found our KIA Sorento sitting front and center in the VIP Parking. The unique night-time lighting as well as the strong architecture lend to a paradise-like stop that will have you imagining you are on an island and in reality you are on your own island, one that will provide you fun for a week or a weekend ~ Universal Orlando. Walking into the doors the first thing you will notice is the clock built into the floor and music blaring everywhere, it is like a party waiting for you to join. We were greeted at the front desk, got our room keys and everyone suddenly scampered. With teens in my crew I was surprised that it took this long for everyone to not saunter off on their own, but discovery had begun and the beginning of a fun weekend at the Hard Rock Orlando and Universal were about to unfurl. From the front desk, we stopped at the populous sitting area, where some people were enjoying Starbucks, and others were enjoying drinks after all it was a Friday night. The capacious couches were beckoning us, even though we had just traveled and were sedentary for hours, we somehow still needed to take a quick rest. 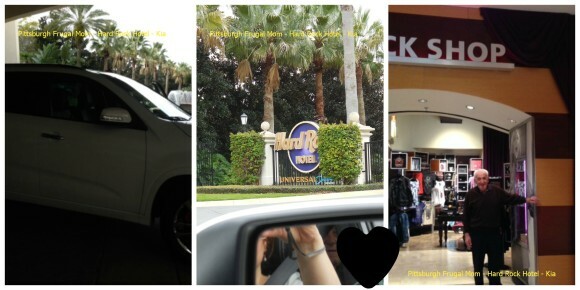 While were were taking in the atmosphere, we noticed the store, which is must when in the Hard Rock. We took a gander and of course made a few purchases. Finally we headed to our room as everyone gathered back together. I am sure you want to see the inside of our room, and we were excited to see it as well, so I snapped a quick photo before we unloaded our luggage and made a beautiful room, very lived in. I also snapped a photo of the hallway so you could see the inside, I felt like such a tourist(lol). You can see how beauteous it all is, but trust me the atmosphere and architect just get better and better with each step on the property. When we arrived in our room, we had a ‘gift’ waiting for us. Take a look at this and well, dare I say the kids were hungry(and us too) so we nibbled, and nibbled and that was all that guitar played. I might also say, the guitar rocked out sweet notes of chocolate, lol! This was so delicious, it ended our day on a positive Note(hahaha) Here is a side note, the hotel provides a twice daily service of a room freshen and an in room Keurig. We had a refrigerator, safe and a hairdryer as well as robes just in case any of you wondering what you need to tote along. We loved all the amenities offered at the Hard Rock Hotel. We took a walk, and the trail is really well lit, and it is such a short jaunt to Universal and CityWalk and you really don’t need the free water taxi, unless you are tired or not up to walking about 5 minutes. 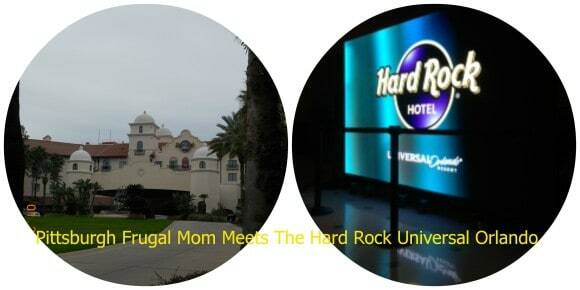 We stayed at the Hard Rock Hotel because of its proximity to Universal Orlando and because when you stay on premises your Express Pass is included with your hotel stay, which makes getting through Universal a literal breeze. We never waited more than 5 minutes for a ride making it a pleasurable park to visit(but this is a different story). The Express Pass can be created in the hotel lobby and takes about 2 minutes to create or if you are totally about selfies, it could take up to 5 minutes as you can do and redo as many times as you want. What you are creating with the Express Pass is a way to get on the rides in Universal in case of lines, it is a small card you carry with you in the park and show to the person tending the lines. This pass is scanned and you are placed in a line that carries you ahead of all those guests that did not a) opt to purchase the pass or b) are not staying on Universal affiliated properties. 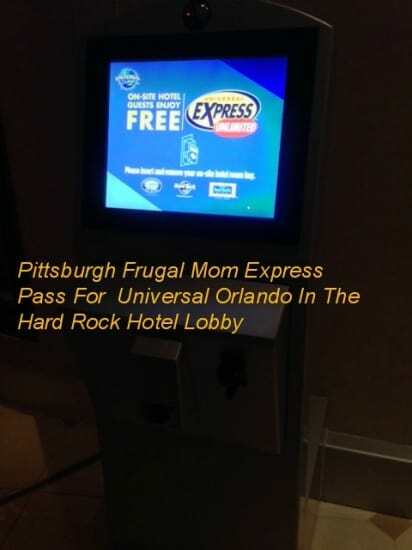 Here is what the Express Pass Station looked like in the hotel lobby. CityWalk is perfect to afford your tweens and teens a bit of freedom from you, without really letting go. The kids can leave the hotel, walk the path to CityWalk(and there were lots of teens doing this) and hanging out in CityWalk at the restaurants and shops. You can also access a free water taxi which goes all around the CityWalk and to all the hotels affiliated with Universal. Wait times were appearing to be about 20 minutes, we never took the taxi, because it was never there when we needed it, so we walked. Again, the Hard Rock Hotel is the best located hotel of all the properties as it sits almost next to(not really, but close enough) to Universal. The walk from our hotel to the park was maybe 5 minutes. I enjoyed our walk each morning as the landscaping is exquisite and you just really feel like you are on an adventure. A feature of the Hard Rock that I appreciated as a parent, is the need for key access on the doors from the pool area and boat landing. In order to enter into the building you need a key and there is an attendant sitting at the pool to see your key when you walk in as well. A few other places we walked in to had no such feature. As far as the hotel itself, there were many restaurants in it for every food want, from a Starbucks Coffee to a more formal restaurant The Palm to the more basic, though very prominent The Kitchen. Once we were parked at the hotel, we never left. We were there from Friday until Sunday afternoon and we had everything we needed in one area, which is remarkable. We walked, the kids swam and went down a slide that was 260 feet. The pool is 12,000 Square Feet, heated and really fun and it has a bar and a tunnel that my kids loved walking under to wind back up to the slide. My kids watched Spider Man poolside one night and there were life guards. The pool has food service right to your chair, so no worries about being hungry while swimming and the hot tubs are a perfect way to unwind and yes we did. If you are up for a little adventure, there are a few other hotels that are on the walking trail to CityWalk so lace up those walking shoes and get read to exercise. 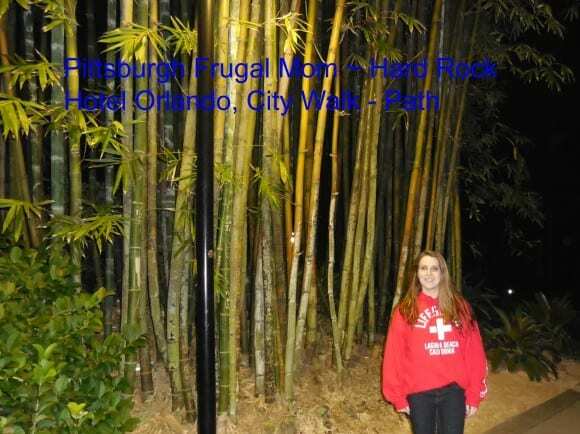 We did see many families dressed up to meet in CityWalk(really dressed up), but there were the majority of us in basic clothing just having a basic vacation. You can make this as dressy or non as you choose. We would like to thank the staff for all they did for our family while we lodged there. The service was wonderful and we truly appreciated all that you did. 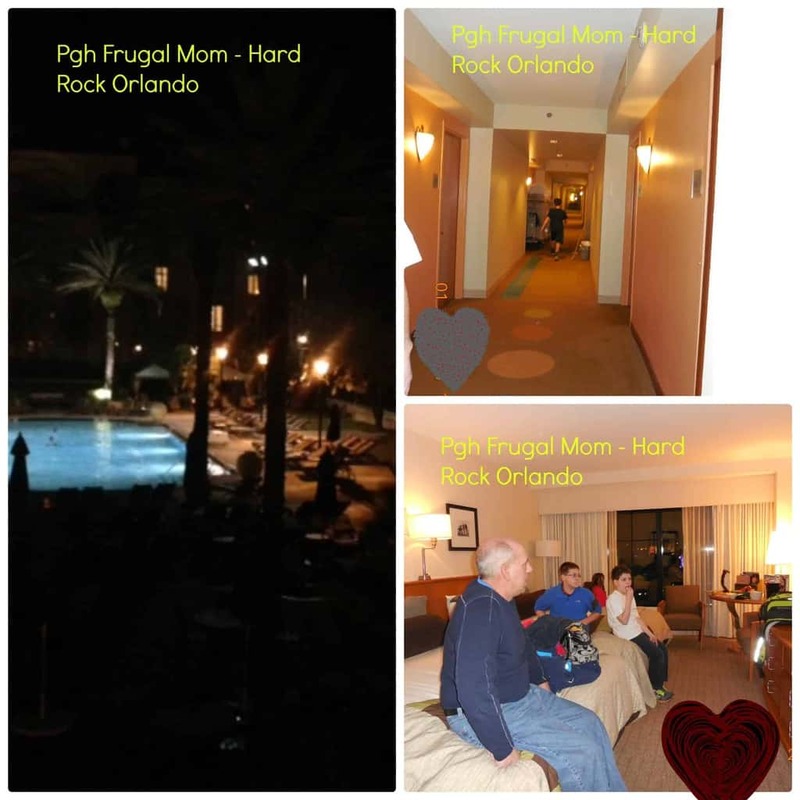 Yes, The Hard Rock Hotel Orlando is a great place to stay with clean rooms, great food, a wonderful pool and the perfect mix of a vacation that is in the heart of everything but away from it all. This is a Pittsburgh Frugal Mom pick because the service, and atmosphere are perfect for families with tweens and teens that need just enough space, yet offers you a way to still stay in control of how far.